Even several weeks into the new year, we’re not ready to give up on 2014 quite yet. Not when it comes to having CDs as good as these to still tell you about, some recent releases from two non-U.S. bluesmen with rather different histories. The first is a Canadian harmonica player who’s been performing live and in the studio for the better part of four decades now, having recorded more than 1,500 album tracks, movie and TV scores, and jingles (for the likes of such advertisers as Tim Hortons, Ford, Chrysler, Labatt, Budweiser, McDonalds, and the Toronto Blue Jays). 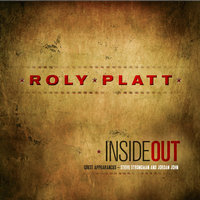 Surprisingly, the one accomplishment harpman Roly Platt‘s résumé didn’t include was any albums of his own – until now, that is, with Platt releasing his solo debut recording Inside Out late in 2014, one we think you’ll agree was well worth the wait. Contrast Platt’s history to that of Danish singer and guitarist Thorbjørn Risager, who now has eight releases to his band’s name since its formation in 2003, including their 2014 self-produced Ruf Records label debut Too Many Roads. With the album and signing to Ruf helping to propel them to new levels of recognition across the world stage, the band has positioned itself as one of the hottest and hardest working “new” acts on the scene with its range of deep blues, rock, and soul sounds. Here’s a closer look at the two projects, either or both of which we can assure you will serve as a fine addition to your collection. A mostly instrumental affair that stretches from the spunky grooves of the opening “Put It Where You Want It” (Joe Sample) and downright elegant covers of classics like “Over the Rainbow” and “Georgia on My Mind” to the funky stylings of Platt’s own “Funk Shui” and jazzy “Congo Strut”, Inside Out also features four pretty terrific vocal tracks. Platt himself sings on one of them, the boogeying, Jerry Lee Lewis-style original “Rippin’ It Up”, while Jordan John lends vocals and acoustic guitar on the closing country ballad “Bartender’s Blues” (James Taylor). But the best of these tracks are the two co-written with and featuring Steve Strongman on guitar and vocals, the soulful mid-tempo “Good Mind to Wander” and the slow blues of “Ocean of Tears” with its tough lyrics like “You said you’d love me forever, but lonely hearts sometimes pretend/ I watch my life drift on by me, I wonder when did your forever end?” and “Send these tears to the ocean, so the ocean won’t run dry/ take these tears of my broken heart, ’til there’s no more, no more left to cry”. Platt’s strong harmonica playing is nicely complemented by some fine work from his band, including some stinging guitar and rich organ on the shuffling boogie “Mad River” and the lively organ of Lance Anderson (who also produced the album) on the energetic “I Got a Woman” (Ray Charles), to cite but just a few examples. It would be difficult to imagine any better of a debut album for Platt, even if he had taken another decade or two to record it, which we’re glad he didn’t. Although we hope it isn’t quite so long before we hear from Platt again, Inside Out does raise an interesting question of how different the industry might be if more musicians were this exacting in their recordings. 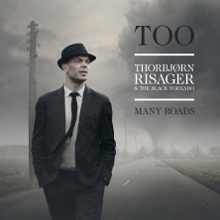 If you’ve missed picking up a copy of Thorbjørn Risager & The Black Tornado’s latest album Too Many Roads, you’re missing out on a mighty good one. The Tornado’s first release on the German Ruf Records label, Too Many Roads nicely showcases the eight-man band’s often soulful, horn-filled blues-rock attack, from the catchy driving shuffle of the opening “If You Wanna Leave” (which you can hear on the latest edition of our BluesPowR Radio Hour) and all-out rocker “High Rolling” to the haunting, hypnotic title track and slow, soulful “Through the Tears”, with other standout tracks including the Doyle Bramhall-ish creeper “Drowning”, a swaying, New Orleans-style “Rich Man” and the closing boogie woogie early rock & roll sounds of “Play On”. With his strong, gritty vocals and skillful playing, Risager may be at the eye of the storm, but, together, this band – practically the same line-up they’ve had since their beginning – is a force with which to be reckoned, with an album that will simply blow you away. This entry was posted in Albums and tagged Roly Platt, Steve Strongman, Thorbjorn Risager. Bookmark the permalink.